Francesco ‘Phra’ Barbaglia, AKA Crookers releases his brand new single, ‘Ghetto Guetta’ via his own imprint Ciao Records on 22 October. Known for his hi octane live shows and productions, this release could possibly set the autumn season ablaze. 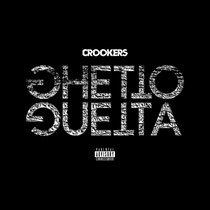 ‘Ghetto Guetta’ goes back to the old school formula that gave Crookers its imitable sound. Recorded on Phra’s laptop across various cities including LA, Lugano and Milan, it showcases his upbeat techno bounce and house beats. The remix package comes courtesy of porducers from the Ciao Records stable, DILLIGAS and Skitzofrenix. Crookers last release; ‘Giga A Go Go’ out earlier this year racked over 60,000 plays on Sound Cloud. His remix of Kid Cudi’s ‘Day ‘N Nite’ reached #2 on the UK sales chart and Crookers’ debut album, ‘Tons Of Friends’ featured a lineup that included Miike Snow, Pitbull and Major Lazer. Phra has already begun work on his next album planned for 2014.